Written by tevensso on February 12, 2011 to Releases and Roxette. Source: P4 Denmark. COPENHAGEN - Roxette is getting nice promo for the new album next week on the Danish radio channel P4. The channel has selected Charm School as the "album-of-the-week" next week. P4 is among of the biggest radio stations in Denmark with the entire country as listeners. P4 will airplay several tracks from the album next week - for instance "Way Out", "Speak To Me", "Dream On", "In My Own Way" and "After All", besides the first single, "Radio," off the album. Submitted by Anders Falck Tindborg. Written by tevensso on February 12, 2011 to Fans and Roxette. BUENOS AIRES - Roxette Latinoamerica website, together with EMI Argentina, are throwing a pre-listening release party for Charm School on February 13 in Buenos Aires. The party is at Saint's Bar, Av. Cabildo 5451, and it begins at 18.00 sharp. All the info for the event plus the flyer can be found on their website. Written by tevensso on February 8, 2011 to Releases and Roxette. Here it is - the traditional Daily Roxette team album review! Lars-Erik, Thomas, Judith, Colin & Paul gathered in the virtual TDR newsroom to write up this special review on Roxette’s brand-new album! Colin: A Roxette album that starts with a mouth harp - that must be a first! The first verse really has that Aerosol Grey Machine studio sound and then at the catchy chorus the heavier guitars kick in. The song has a really positive vibe to it and to me it feels like a sequel to “June Afternoon” – awesome! Thomas: “We will we will rock you!” drums. Love those guitars. And it must be Per playing that first weee-wah-wah-wah-wa after the first chorus! They also used a mouth harp in “I Remember You” if you remember. Colin: Oh I do remember! That was my first Roxette song - loved it! Paul: This song reminds me more of “Stupid” from The World According To Gessle. The drum beat is very similar indeed. Lars-Erik: You know you’re right! I thought this had a familiar sound to it and that was it! Paul: Not a typical Rox-album-opener really. I was expecting something along the lines of “Crush On You” or “Real Sugar”, so this came as a surprise… a nice surprise. The song, as with a few others on the album, is too short though. A Marie middle-8 would have fixed that problem Mr G! Thomas: 2.46?? That’s barely longer than “Här kommer alla känslorna”. Judith: Now that you mention this song, I keep having this one in mind when I listen to some of the tracks on this album. It must be the happy mood. This album has a lot of the Roxette sound we know, but yet we get to hear some new sounds we never heard with Roxette before. This is one example. Great guitars and opener! I am glad that Per realized he can use and experiment with his voice a lot more than he used to! I must say both sing wonderfully on this album. I think this is a wonderful album so you won’t get much negative points from my side, I am afraid. The only one is that the album is too short! I want more!! 2-3 more songs would have done it. Thomas: Yes, what else is there to add? This is one of my favorites as well, maybe even “The Favorite” and I had hoped the whole album had been a bit more like this song. Colin: Definitely one of my favorites too, after listening to the albums a few times this is the chorus that really keeps hanging around in my head! Lars-Erik: Nobody’s mentioned the ending… I really like it! I think the distorted guitar there is cool! Thomas: Yes we did! We all felt it came way too soon! Written by roxtexanet on February 8, 2011 to Awards, Releases and Roxette. MONTREAL - Roxette's Charm School will finally see the light of day in Canada on March 29, according to EMI Canada's website. 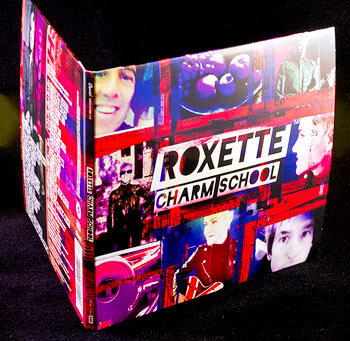 As yet, it is unclear whether the CD release will be the regular or deluxe version, but the vinyl LP will be released the same day - the first vinyl release for Roxette in Canada since Look Sharp! in 1989! As everywhere, the lead single is "She's Got Nothing On (But the Radio)" which has already aired on Montréal's largest radio station, CKOI. This is the first major Canadian radio station to play a new Roxette single since "Wish I Could Fly." Listeners can vote for the song on the daily top 6 at 6 by visiting their website. "Radio" is also getting airplay on KIX 106 in Alberta. Can a Canadian tour date be far behind?! Written by eBay on February 8, 2011 to Roxette and Sales & Charts. "She's Got Nothing On (But the Radio)" enters the official German singles chart at #18! This is Roxette's biggest hit in the third biggest music market worldwide since "Sleeping In My Car" hit #11 back in 1994. Written by Roxwriter on February 6, 2011 to Roxette and Video. SYDNEY - The Australian TV Channel "MTV Classic" once again aired their "Roxette Live in Sydney Special" (basically a cut-down version Live-Ism) but then immediately after they debuted the video for "She's Got Nothing On (But the Radio)". This Australian Roxer nearly fell off his chair when after the credits to "Live-Ism" ended and suddenly heard the thumping bass of the new single! Also, the Australian Broadcasting Corporation (ABC TV) aired the video too on their morning program "Rage" at about 8.30am on Sunday February 6! This reporter is urging all Aussie Roxette fans to get in touch with their respective music channels and get requesting! Also, an ad for Charm School appeared during the show "Video Hits". Neilandkathie and Bwad contributed to this article. Written by tevensso on January 30, 2011 to Internet and Roxette. As expected now the full album, both CDs, have leaked to the Internet. According to TDR's sources the originating IP address is Swedish.